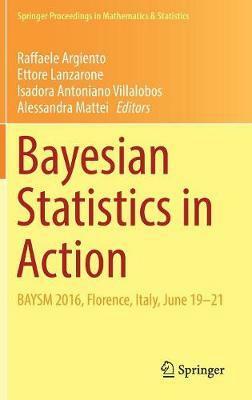 This book is a selection of peer-reviewed contributions presented at the third Bayesian Young Statisticians Meeting, BAYSM 2016, Florence, Italy, June 19-21. The meeting provided a unique opportunity for young researchers, M.S. students, Ph.D. students, and postdocs dealing with Bayesian statistics to connect with the Bayesian community at large, to exchange ideas, and to network with others working in the same field. The contributions develop and apply Bayesian methods in a variety of fields, ranging from the traditional (e.g., biostatistics and reliability) to the most innovative ones (e.g., big data and networks). Illustrations note 44 Illustrations, color; 12 Illustrations, black and white; IX, 251 p. 56 illus., 44 illus. in color. Raffaele Argiento is an assistant professor of statistics at the Department of Economic, Social, Mathematical and Statistical Sciences (ESOMAS) of the University of Turin, Italy. He obtained an M.Sc. degree in mathematics from Federico II University, Naples, Italy, in 2000 and a Ph.D. in statistics from Bocconi University, Milan, Italy, in 2007. He is affiliated to the "de Castro" Statistics initiative of the Collegio Carlo Alberto, Turin, Italy. He is a member of the board for the Ph.D. in statistics at Bocconi University. His research focuses on Bayesian parametric and nonparametric methods from both theoretical and applied viewpoints. He is the executive director of the Applied Bayesian Summer School (ABS) and a member of the BAYSM board. Ettore Lanzarone is a researcher at the Institute of Applied Mathematics and Information Technology ``E. Magenes'' (IMATI) at the National Research Council of Italy (CNR) in Milan, Italy. He obtained an M.Sc. degree in biomedical engineering and a Ph.D. in bioengineering from Politecnico di Milano, Italy, in 2004 and 2008, respectively. He is adjunct professor at the Department of Mathematics of Politecnico di Milano, Milan, Italy, and a collaborating member of the CIRRELT laboratory, Montreal and Quebec City, Canada. His research interests include prediction methods (Bayesian in particular), optimization and operations research, and bioengineering. He is cofounder of the BAYSM conferences and a member of the BAYSM board. Isadora Antoniano-Villalobos is an assistant professor of statistics at the Department of Decision Sciences and a member of the board for the Ph.D. in statistics at Bocconi University, Milan, Italy. She obtained an M.Sc. degree in mathematics from the Universidad Nacional Autonoma de Mexico (UNAM), Mexico City, Mexico, in 2008 and a Ph.D. in statistics from the University of Kent, Canterbury, UK, in 2013. Her research focuses on nonparametric Bayesian models and methods, sensitivity analysis, and extreme value theory. She was chair-elect and chair of the junior section of the International Society for Bayesian Analysis (j-ISBA) in 2014 and 2015-2016. Alessandra Mattei is an assistant professor of statistics at the Department of Statistics, Computer Science, Applications ``G. Parenti'' at the University of Florence, Italy, where she also obtained her M.A. in statistics and Ph.D. in applied statistics. In 2012 she was a research fellow at the Statistical and Applied Mathematical Sciences Institute (SAMSI), NC, USA. She has given short courses in Causal Inference. She is currently associate editor for the Journal of the Royal Statistical Society A. Her research interests include causal inference in experimental and observational studies, Bayesian inference, and inference with missing data problems.